SONAR Artist, the most feature-packed recording software in its price range, offers unlimited track counts, superior audio quality, video support, and the same hightech specs as our flagship Platinum version. Enabled for touch control, the awardwinning Skylight User Interface's inspiring and efficient workflow lets you focus on the music. 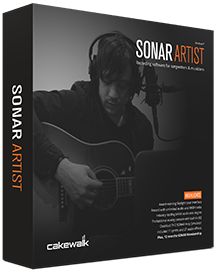 With 19 bundled effects and 11 virtual instruments, SONAR Artist has everything needed to craft your masterpiece. Pay for SONAR in monthly installments for 12 months and own SONAR forever. Buy SONAR Artist online from the Steam Store.